The NavfnPlanner is a planning module that implements the nav2_tasks::ComputePathToPose interface. A planning module implementing the nav2_tasks::ComputePathToPose interface is responsible for generating a feasible path given start and end robot poses. It provides the equivalent functionality to a GlobalPlanner in ROS1 MoveBase. Currently, NavfnPlanner's core algorithm is a direct port from the ROS1 MoveBase Navfn planner. The Navfn planning algorithm is based on the Global Dynamic Window Approach. In Dijkstra mode (use_astar = false) Dijkstra's search algorithm is guaranteed to find the shortest path under any condition. In A* mode (use_astar = true) A*'s search algorithm is not guaranteed to find the shortest path, however it uses a heuristic to expand the potential field towards the goal. The Navfn planner assumes a circular robot and operates on a costmap. The Navigation System is composed of three tasks: NavigateToPose, ComputePathToPose and FollowPathToPose. 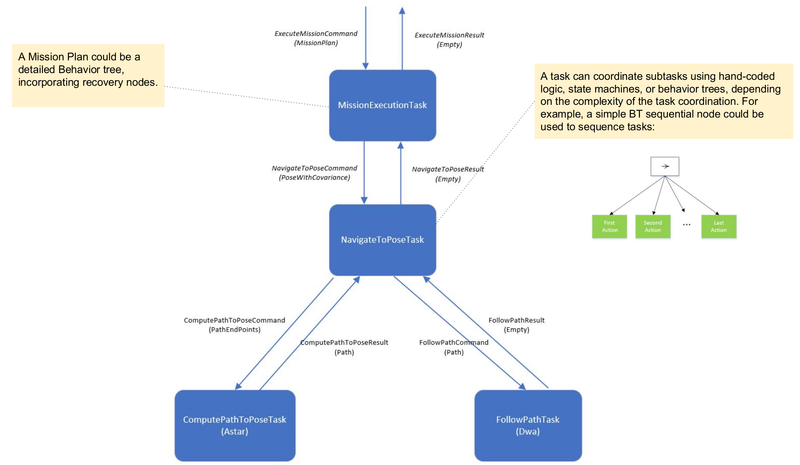 The DijkstraPlanner implements the Task Server interface for ComputePathToPose, specifically derives from nav2_tasks::ComputePathToPoseTaskServer. The client to DijkstraPlanner is 'NavigateToPoseTask', which periodically sends requests to the path planner.